On one of the first trips on the guides course, we were driving along the southern coast with its sand dunes, from Gaza to Ashkelon. Haim Karel, the course coordinator, stopped the bus, we all got out and crossed the road to look at a large pit with rows of niches arranged in the walls built of kurkar blocks. The site is completely unmarked and not visible from the road – as the guide, you have to know where it is. Kurkar, is a kind of rock found along the Mediterranean coast, formed when the ocean spray carrying limestone glues the sand together to form rock. Haim explained that the structure is a columbarium, from the Latin columba meaning dove. It is our conviction that this building, like similar though larger buildings discovered in Italy, was designed to receive the remains of cremations. It is probable that Herod built it for the burial of his servants, ministers or other members of his court who were not Jewish. Two buildings, square not circular, but with similar niches in their walls, were found in the north-western part of the wall; it is possible that they fulfilled the same function. 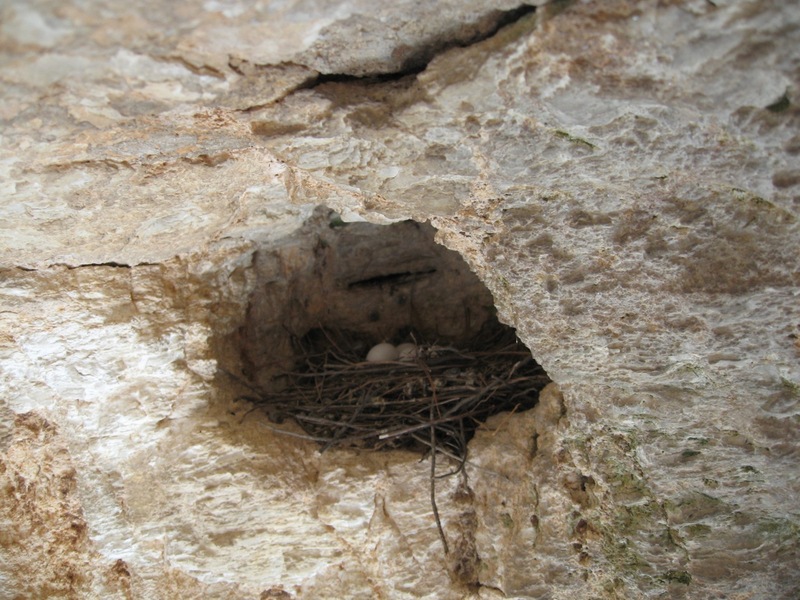 Yadin even describes how Moshe Yoffe who worked on the excavation team and raised pigeons at home brought in a very small pigeon but couldn’t cajole or force it into one of the niches. In Jewish tradition where burial is outside the city and cremation is against Halacha (Jewish law) it seems unlikely; also, there were no human remains found here nor pottery shards, from the urns which may have held human ashes. Another suggestion is that these caves were filled with water and used to raise fish. The consensus though is that they were used to raise doves or pigeons. The name columbarium comes from the Latin columba meaning dove. Doves/pigeons were used as a source of food and for sacrifice. My mother tells how in Israel in the 1950s when food was scarce and rationed, our neighbor kept pigeons and I was fed pigeon as a baby. The excrement makes excellent fertilizer for growing vegetables. The birds could be used for communication as they would fly back to their home. But you don’t have to go as far as Masada, there are columbaria in other parts of Israel, for example, at Maresha/Bet Guvrin. After Alexander the Great’s conquest of Judea in 332 BCE, Maresha developed as a diverse town with Sidonians, Greeks, Jews and Egyptians arriving and settling there. 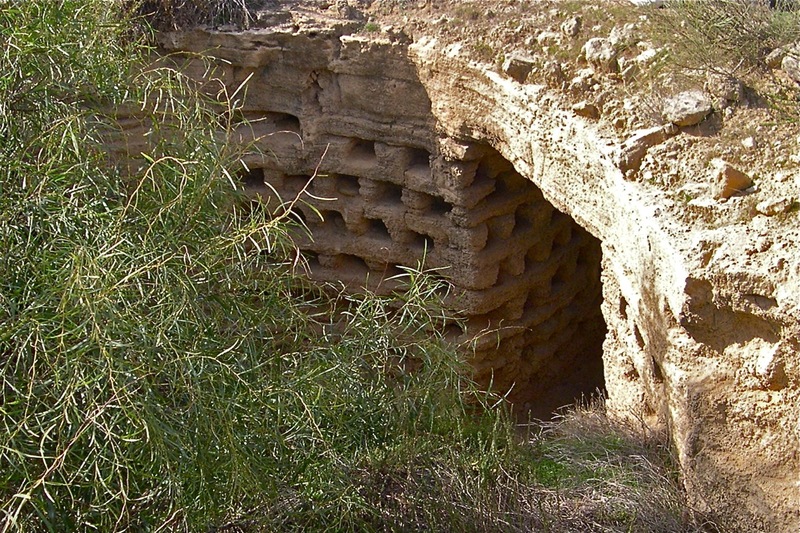 Residents of Maresha took advantage of the naturally soft limestone to quarry water cisterns, olive presses and columbaria beneath their homes. Don’t miss the columbarium at Tel Maresha where you descend into a tremendous cross-shaped cave with niches for more than 2,000 pigeons; so far more than 60 columbaria have been found in the Maresha region. Near Nes Harim there is a nice hike through the natural oak, pistachio and carob trees in the Judean hills that takes us to the spring at Hurvat Itab among olive, fig and almond trees. In a large cave nearby is a columbarium for keeping pigeons. At Ramat Rahel, a burial cave, columbarium and ritual baths characteristic of the Second Temple period were uncovered by Aharoni (1962). 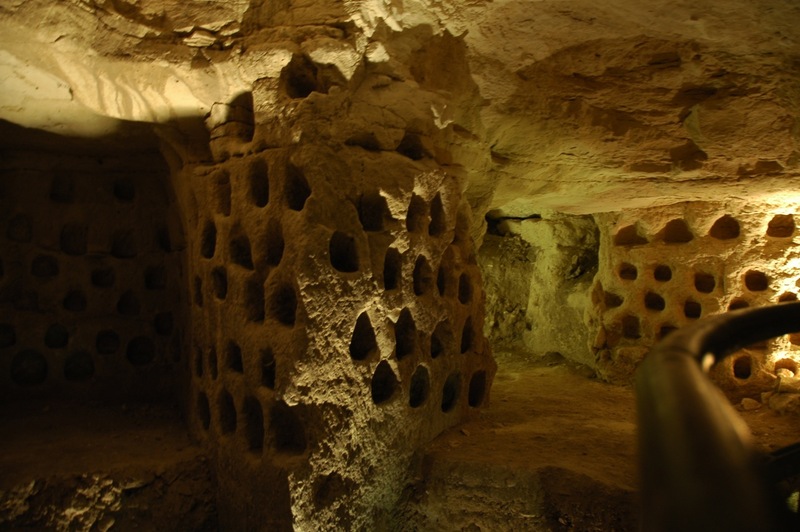 The caves and columbarium were hewn into soft nari bedrock. On one of my visits to the archaeological site, I had climbed down into the columbarium to look around and was able to take this photo of one of the niches. This entry was posted in Archaeology and tagged columbarium, dove cote, Herod, King Herod, Maresha, Masada, palace/fortress, pigeon coop, Ramat Rahel, Yadin on December 12, 2010 by Shmuel Browns. I just finished reading Meir Shalev’s story, The Pigeon and the Boy about a boy who looked after homing pigeons for the Haganah around the time of Israel’s War of Independence in 1948. One of the main characters is Yair a tour guide. “A mesmerizing novel of two love stories, separated by half a century but connected by one enchanting act of devotion”. Worth reading! I thoroughly enjoyed it.